This 8 Spring Gay Wedding Favor Essentials post was written for A Bride On A Budget on behalf of Beau-Coup. This post contains affiliate links and I will be compensated if you make a purchase after clicking through my links. Spring is in the air and with legislation passed to allow gay marriage in all 50 states (and Washington DC), it's time to prep for some gay friendly favors. We know that spring wedding favors are green, pastel, and may feature flowers, but what about for a gay wedding? Below you'll find out what makes these eight options from one of the most popular wedding stores online. Plus, we'll let you know why they're gay friendly. But first, there are three big things to knowing you have gay friendly wedding favors. They come in brides OR grooms or have options to select either brides or grooms. If you find any mix of these three things, you know you have a gay friendly wedding store or vendor. Combine that with popular spring favor ideas and you've got a winner. 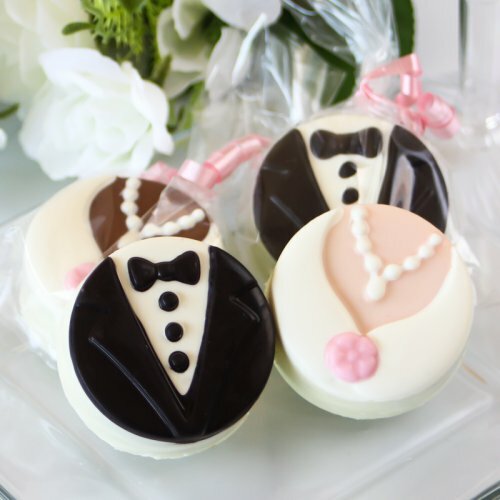 Bride or groom chocolate covered Oreos are always a hit. Choosing white tuxedos can be a great option for spring, but let's face, it, these delicious treats are awesome for a burst of sugar-fueled energy and great in any color! 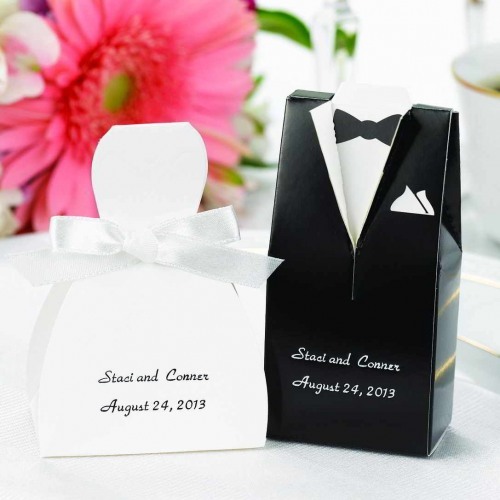 Although these aren't spring, these tuxedo or gown favor boxes are classics for gay weddings. You can select either tuxedos or gowns for these fun favor boxes making them a perfect way to display a present for your guests. Plus, you can fill them with any treats you want, regardless of what color your wedding theme is. Since they'll be closed anyway, no one will see what's inside (until they peek, anyway). 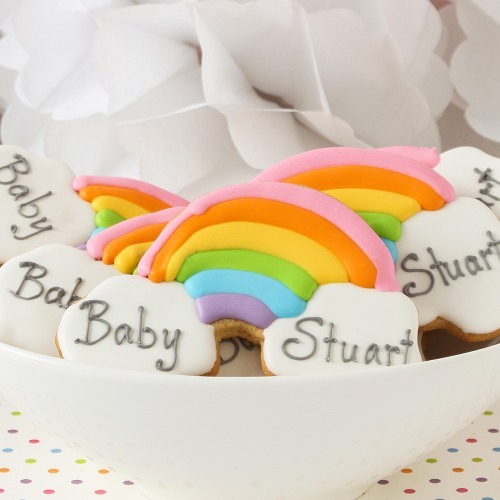 Although these rainbow cookies are meant for baby showers, nobody will know the difference when they see the brides' or grooms' names on the clouds of these delicious rainbow cookies. If you're celebrating and want to go "over the rainbow," these tasty treats will help take you there! 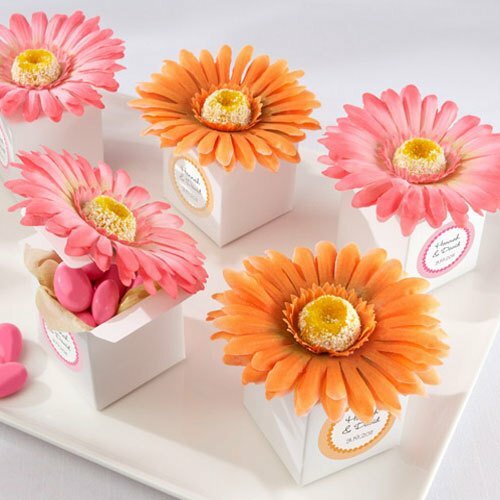 These gerber daisy flower boxes are fabulous for any wedding. The bright colors scream spring and you can always provide people with a safety pin to clip them onto their outfits. They're the perfect spring favor boxes to have fun and present a gift to at a gay wedding. 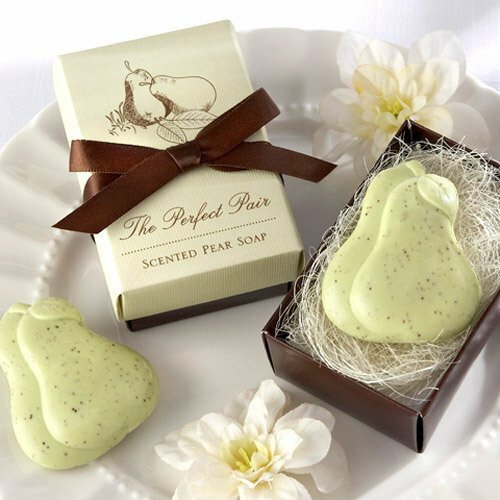 If you like emotional, classy, and traditional, you cannot go wrong with the perfect pair soap favors. They're shaped like a pear and come in a very spring green with brown packaging. This fun and fresh gift will leave guests with loving memories of a truly perfect "pair." You could do the birdhouses or love birds thing, but they're really overdone. Why not be cute and functional with a "kitschy" kitchen gift? 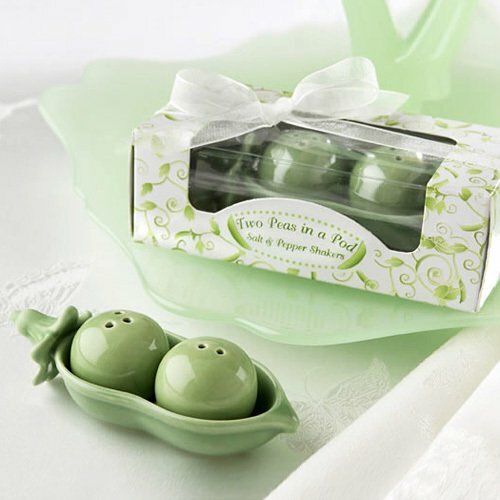 The two peas in a pod salt and pepper shakers are the perfect color and amount of fun for your spring gay wedding favors. I could make a million puns about how your life is blooming or how you'll grow together, but we'll "leaf" that up to you. 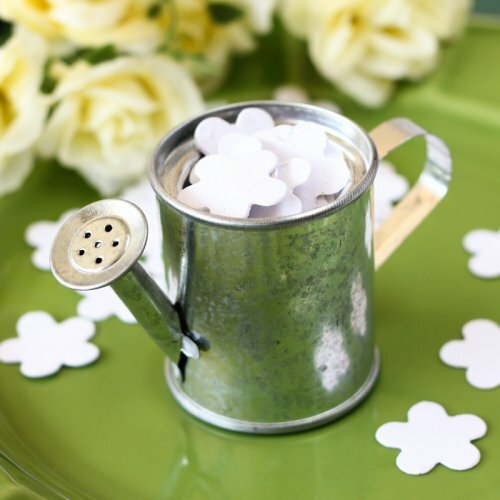 This fun plantable flower confetti pieces can be planted to grow flowers. Spring is the time that they bloom and having a garden grow from the your wedding confetti isn't only eco-friendly, it's a fun reminder of when your guests helped to celebrate your big day. Want something rustic, chic, and absolutely full of spring? 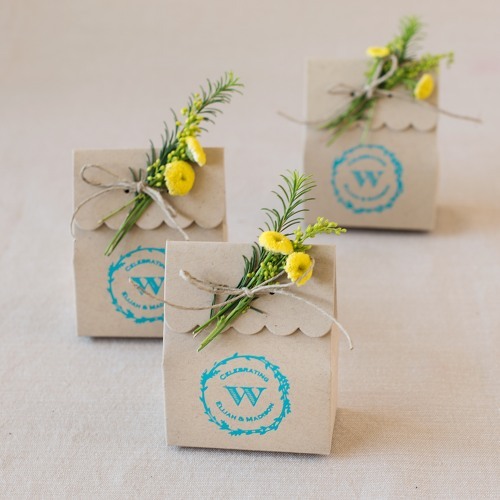 These scalloped favor bags feature a fun yellow flower and a fabulously fresh feeling of spring with the matching greenery. Perfect for any couple with an outdoor wedding, they scream spring wedding. 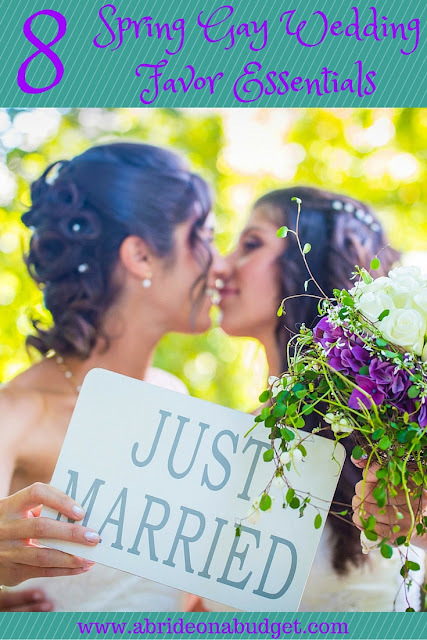 Gay weddings and straight weddings are pretty similar when it comes to what to use. If it's in the spring, think pastels, plants, and fresh/clean. If you're shopping for a gay wedding, make sure the vendor is gay friendly so there are no surprises later on. If you need any more suggestions on favor, gift or décor ideas, click here to visit one of our favorite wedding favor and supply shops. BRIDAL BABBLE: Which of these Spring Gay Wedding Favor Essentials is your favorite? These are all beautiful wedding favors!!! I love the idea of cookies for a wedding favor!! Can you believe I've never been to a wedding with cookies as the favor? I've seen them at weddings as part of a dessert hour, but never the favor itself. These are so cute! I love that little flower back and the bride and groom oreos!!! The bride and groom Oreos taste so good too (and I'm actually not an Oreo fan!). I love the cute little favor ideas! I am slowly starting to plan and I can't wrap my head around how much planning! Thank you Lisa! There's a lot to do Gabby. Start with the little things and get them out of the way, then move on to the big things.